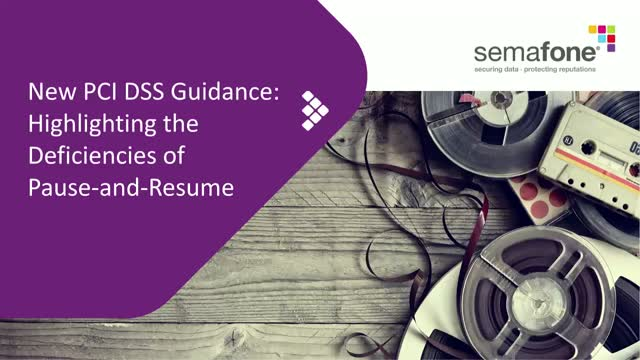 One major clarification the guidance makes is targeting pause-and-resume call recording solutions and the potential for cardholder data to make its way onto recordings, thus breaching compliance. Register now to reserve your space! For any healthcare organization, the contact center is a major hub for patient communications, whether it’s processing a great deal of Protected Health Information or collecting payments for billing purposes. With healthcare organizations suffering the most data breaches of any industry, it’s never been more important to take the proper precautions to protect the contact center and prevent fraudsters from stealing this sensitive information. Over the last seven years, the technologies used by call and contact centers to communicate with customers and complete card transactions have changed drastically. Networking methodologies like VoIP have since become widely adopted, while the number of applications organizations employ to process customer information has risen dramatically. For this reason, the PCI SSC recently released their highly anticipated updated “Guidance for Protecting Telephone-Based Card Payments” for the first time since 2011, offering several much-needed clarifications for organizations looking to achieve PCI DSS compliance inside their contact centers. With the Holiday Shopping Season now upon us, consumers are opening their wallets in earnest, with some estimates putting spending at over $1 trillion in the US alone. Brands everywhere can expect to see a huge spike in sales, and along with it, an increase in payment fraud. Not only does the influx of transactions make it harder to detect fraudulent activity, but swarms of temporary seasonal workers can become insider threats that compromise an organization’s security procedures. Make sure to reserve your seat by registering now! Healthcare call and contact centers face some tough challenges when it comes to data security. In fact, healthcare data breaches are reported at a rate of more than one per day in the US alone, exposing patients’ personally identifiable information (PII)—from medical records to payment card data and beyond—to the wrong people. Earlier this year, IBM published their 2018 Cost of a Data Breach Report, which stated that, for the 8th year in a row, healthcare organizations had the highest costs associated with data breaches—$408 per lost or stolen record. That’s nearly three times higher than the cross-industry average of $148. These challenges are not unique to the healthcare sector. All call and contact centers face similar obstacles and need to consider if their Payment Card Industry Data Security Standard (PCI DSS) compliance strategy is sound. On May 25, 2018, the European Union's General Data Protection Regulation (GDPR) went into effect, becoming the world's strictest and most comprehensive data protection legislation. Companies around the world, regardless of whether they are physically located within EU borders, had to meet compliance requirements if they process the data of EU citizens, creating a huge headache for any organization running a call or contact center. For contact centers that have troves of sensitive customer information, GDPR compliance can easily become a massive undertaking. However, using preexisting tried-and-true frameworks like the PCI DSS, companies can relieve the burden of meeting compliance obligations. Additionally, registrants will receive a free copy of Semafone's GDPR Guide for Contact Centers. John ‘Jay’ Trinckes, Jr., CISSP, CISM, CRISC, HITRUST CSF Practitioner leads NCC Group’s healthcare practice by assisting clients in managing their IT risk to ensure they are not subject to cyber-attack along with helping them validate their compliance with IT regulations such as HIPAA. Jay is the author of three books, “How Healthcare Data Privacy Is Almost Dead…and What Can Be Done to Revive It! (2017), "The Definitive Guide to Complying with the HIPAA/HITECH Privacy and Security Rules" (2012), and "The Executive MBA in Information Security" (2009), and has a wide range of experience in computer networks, vulnerability and penetration testing, security, compliance, and risk assessment. In this session, we cover the newest payment methods organizations are using, and we'll discuss how executives plan the move to more secure and convenient ways to receive consumer payments. We'll also include exclusive research from Ovum! PCI DSS compliance and data security is a perennial challenge for any organization, especially for those operating contact centers. With potentially hundreds of PCI controls to keep track of, it's easy for things to get lost in the mix. When tackling compliance and cybersecurity issues, it's a common mistake to only focus on the organization's IT infrastructure, and neglect to examine the people and underlying processes handling sensitive customer and payment card data. Any company that takes payments over the phone must comply with the requirements of the Payment Card Industry Data Security Standards (PCI DSS), and all the costs and headaches that come with it. Learn about how to achieve PCI DSS compliance for your entire contact centre, and how to reduce the amount of applicable PCI DSS controls in your business infrastructure. Make no mistake—it isn't a question of if your company will be breached, but when. However, with such high rates of security incidents occurring, many organizations choose to put off implementing the right data security measures until it's too late. Additionally, you'll learn how to increase customer service and satisfaction, while reducing the associated security costs. Companies today must navigate a minefield of compliance and regulatory challenges, especially in highly regulated industries where call recording in contact centers is standard, if not a mandated requirement. At the same time, standards like the PCI DSS uphold that no Sensitive Authentication Data (SAD) from payment cards may be recorded at any time, creating a conundrum for companies trying to maintain full call recordings. Although Pause & Resume call recording methods have become a widely used contact center practice, it does not necessarily deliver guaranteed or robust PCI DSS compliance. In fact, these solutions often cause more problems than they solve – and these flaws can result in systemic governance failures. Additionally, you'll learn how to increase customer service and satisfaction, while reducing reducing the associated costs of PCI DSS compliance. With cyberattacks happening with greater frequency every year, and the average cost of a data breach at $4 million in 2016 according to the Ponemon Institute, it has never been more important to ensure your organization is following security best practices to prevent a breach of its own. Additionally, you'll learn how to eliminate the need for customer cardholder data to be handled by your contact center agents or held in your contact center infrastructure, while improving customer service and satisfaction. Semafone enables simple, fast, cost-effective PCI DSS compliance and data security for your contact center. Taking payments over the phone is essential for many organizations. Customers need to know they can trust you with their sensitive personal information. Semafone's signature solution Cardprotect makes it easy to tackle payment and data security issues in the contact center – without compromising on customer experience.